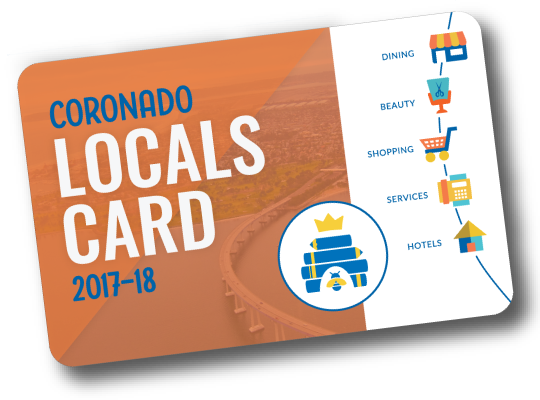 Thank you Coronado…we are so close! 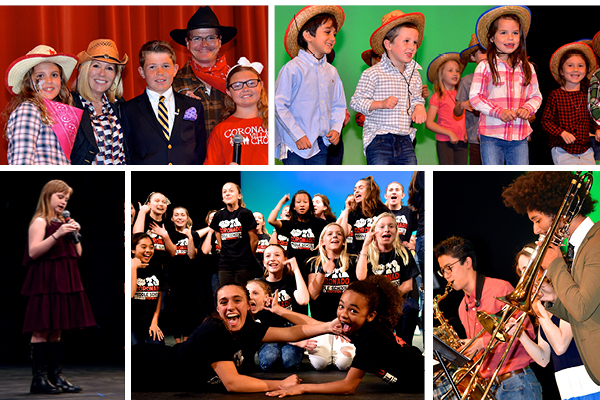 Along with over 100 volunteers, principals, teachers, and students on stage and behind the scenes, the Coronado Schools Foundation Telethon brought out the best in the community again this year. While the Wild West carnival entertained families the donations rolled in with support from community, businesses, and parents all to benefit Coronado’s public schools bringing us so close to our goal to return $1,000,000 to the schools for the 2018-19 school year. If you did not get a chance to donate yet, it’s not too late, every dollar counts! 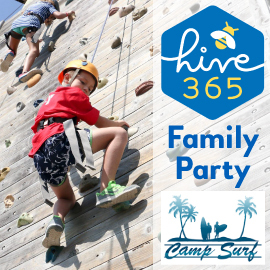 On Sunday, April 22nd we will be hosting Hive 365 families to a fun family-filled day at the YMCA Camp Surf. If you are “in the hive” (have donated a total of $365 in donations this school year) you will be receiving an invitation via email. If you would like to be included but have not donated yet, there is still time to donate: csfkids.org/give. CSF and Coronado Middle School are happy to host our next Behind the Scenes Tour on Wednesday, April 18th. 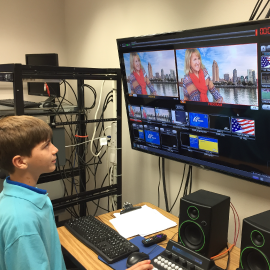 We would like to extend this invitation to 5th grade parents with incoming 6th graders and donors who would like to see their donations “at work.” If you would like to attend the tour please send an email to michelle@csfkids.org. Holocaust survivor Mike Resmo with CHS Principal Jenny Moore and Superintendent Karl Mueller. One of the many student events made possible by funding from CSF. Your donations have been visible in our schools this month. Thanks to a grant from the Copley Foundation, CSF underwrote the recent Every 15 Minutes program for Coronado High Juniors and Seniors, focusing on the importance of focused and unimpaired driving. In partnership with the Chabad of Coronado, 10th graders took a field trip to the Museum of Tolerance in Los Angeles in conjunction with their World History curriculum. 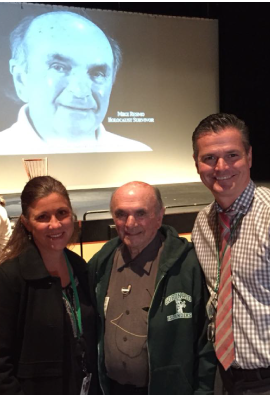 Later that week, Holocaust survivor Mr. Mike Resmo shared his impactful story with 9th and 10th grade students. Next week artist and CHS alum Kelcey Fisher will launch a new art installation at the school, partnering with Advanced Art students in Mrs. Laura Hill’s class. Meanwhile over at Coronado Middle School, Performing Arts students captivated audiences in Bye Bye Birdie, under the direction of Mrs. Linda Kullmann. Look for the “funded by CSF banners” for these and other events on campus. Business partner and CUSD parent Kraig Nicolls of Nicolls Design Build donates all of the banners we use to promote our CSF events to the community, Thank you Kraig! 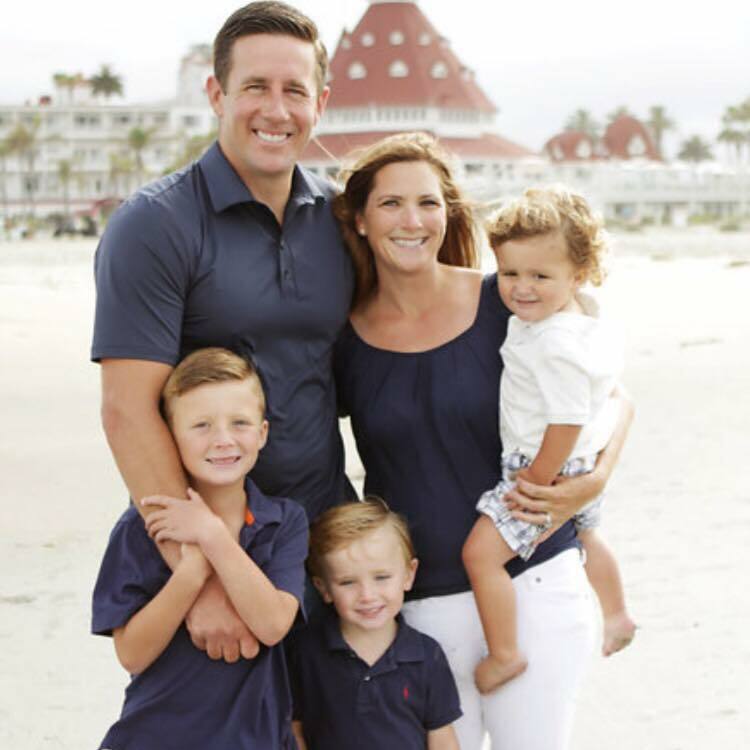 This month’s volunteer spotlight highlights our extraordinary CSF Board member, CUSD parent and alum, Mrs. Laura Galdorisi O’Sullivan. Laura joined the board in 2017 and instantly hit the ground running, volunteering for everything from stuffing thousands of back to school goodie bags to chairing this year’s “Golf Cart Opportunity Drawing,” which brought in record funds! Laura is dynamic and creative and is always willing to lead or assist, taking on each project with a huge smile and tons of enthusiasm. Our overall success as an organization is thanks to the energy and support from volunteers like Laura! Spiro’s Greek Café owners Nancy and Spiro Chaconas with sons Michael Chaconas and Demetri Chaconas, and manager Robyn Gray. Photo by David Axelson, courtesy of Coronado Eagle & Journal. Spiro’s Greek Café located at the Coronado Ferry Landing generously offers 10% discount off food with your Locals Card. Dr. Spiro and Nancy Chaconas, proud parents of CHS graduates Michael and Demetri are long-time supporters of the Coronado Schools Foundation. Dr. Spiro served as CSF Board President and sponsored the 30th Telethon for the ninth consecutive year as an Underwriting Partner. With annual support for the fall Benefit Auction, Dr. and Mrs. Chaconas’ support of the community through Spiro’s Greek Cafe is a staple in our town. 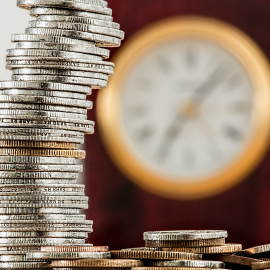 With years of teaching and professional experience, Steve Reiss knows everything you would ever need to know about the all-important, often stressed over SAT and ACT college assessment tests. Partnering with CSF to offer SAT and ACT Test Prep classes, this self-proclaimed “most boring author in San Diego” has written or edited over 60 books for people preparing to take the SAT, ACT and other tests. Learn more about our expert instructor, and what is covered in the classes in our blog post. Discount does not apply to alcohol; based on availability; reservations recommended. Buy 1, get 1 free tastings at the Distillery. Tasting Fee waived with bottle purchase. 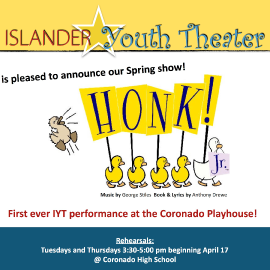 Thanks to the continued generosity of The Vernetti Family, registration is now open for the Islander Youth Theater production of HONK! JR. The final performances will be at the Coronado Playhouse at the Coronado Community Center. Students in 3rd through 12th grade can register to participate in this endearing musical.